I have to share something funny because no matter the pain and frustration, there always seems to be a “funny” connected with my hospital adventures. This past weekend, in what had to have been a world-class acrobatic feat, I dislocated my hip while turning in bed. Second dislocation. Color me UNAMUSED! Another 911 call and painful ride to the hospital. One good thing was that the Firemen did not have to breakdown my door again since I haven’t fixed it from the last time. ONe of the paramedics was the same that attended my last “event”. He remembered me. He also remember my grandson had been there the first time and that …as he reminded me…I could say all the bad words I wanted because there were no little ears to hear this time. Ha. Ha. Very Funny. But I digress…. After another Mr. Toad’s ride to the hospital, hitting every possible pothole available in Columbus, the orthopaedic team was called to my aid once more. I got more drugs, recited my medical history to them. One. More. Time. They did their thing and left me to heal. You know I honestly think they make you repeat yourself a hundred times in the hospital to see if they can catch you in a lie. I mean it is all written in my damn chart! It did have to finally zing one of the nurses when she asked, “what happened to you?”. I told her I was swinging from the chandelier and the leather restraints on the harness broke. Now, I didn’t pay much attention to her but I did feel that she was putting something around my wrist but hey, at that point, she could have cut my hand off and I’m not sure I would have noticed. We chatted on the way to x-ray…well he chatted, I listened and tried not to drug-drool too much. Even in pain and drugged I thought that a very odd thing to say to a woman who had dislocated her hip for a second time but I let it pass and assured him I had no jewelry on. He just smiled and waved good-bye. So I’m laying back in the bed and I happen to look down, at the very bright neon yellow wrist band and I knew what the chuckling had been about. 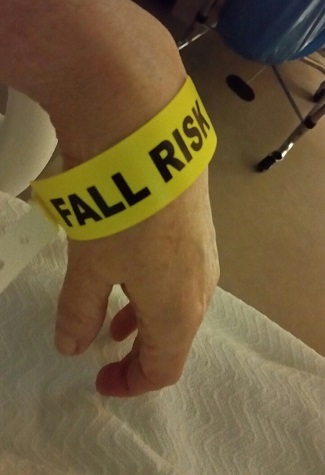 The wristband said, “FALL RISK” in huge thick black letters that could be read across a dark room on the neon yellow background. I started laughing, which hurt my hip like hell but I couldn’t stop. There I was, laying in a hospital bed, WITHOUT MY PROSTHESIS ON……and they considered me a fall risk. I could see a Crawl Risk maybe…but a Fall Risk would indicate I could stand and would be in danger of falling. WHICH I COULD NOT DO! The way they had me strapped in to the wedge pillow between my legs and the fact I didn’t have my prosthesis on, to fall from the bed, someone would have to dump me out. Hearing me laugh, the “zinged” nurse came back in. THE nurse who put the damn thing on me in the first place. “Glad to see you’re feeling better,” she said. ‹ The Now is Now: What would you do?